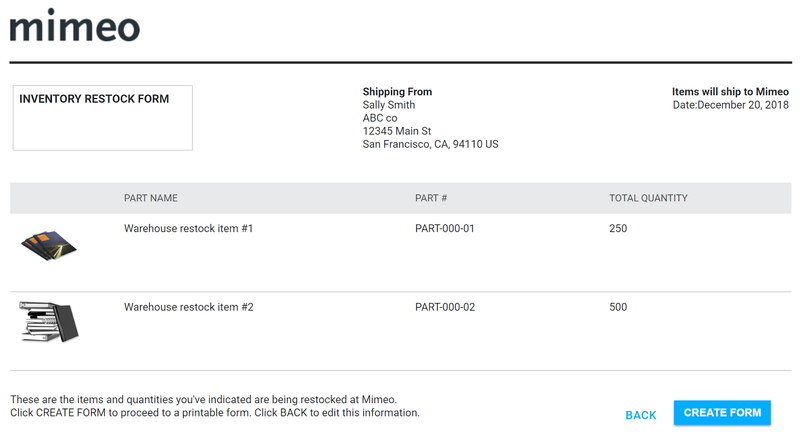 Here’s how to create a packing slip to communicate what will be shipped to Mimeo to replenish warehoused materials. 2. In your Warehouse folder, select the items you’d like to Restock -- it’s just like you’re ordering materials on Mimeo Print! 4. Click Create Form and your packing slip will appear. You’ll receive a confirmation email of the inventory you’re sending to us. 5. Print a copy(s) of your packing slip or email it to your vendor so they can include it in the shipment. Please include a copy of the packing slip in each box of the shipment. *Note: This does not apply to inventory that Mimeo automatically replenishes for you or inventory ordered by Mimeo (we’ll handle it! ), as we manage the process for you from start to finish. If you need help replenishing inventory that Mimeo orders for you, please contact your Customer Success Manager or 1-800-GOMIMEO. Does Mimeo produce and distribute non-print items?